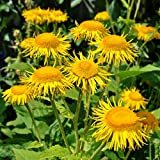 Elecampane growing herbaceous of the genus Inula also known as Inula helenium, Elecampane perennial deciduous used as ornamental or medical plant, can grow in temperate, subtropics climate and growing in hardiness zone 4-9. Leaves color green in elliptic or ovate with stem like spoon margin serrated. 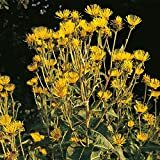 Flower color yellow, in disc shape with multi petals the petals narrow. 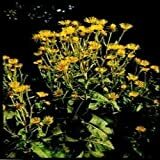 Yellow disc flower with multi petals the petals narrow.